The Arnolfini Wedding is a central image of my first novel, Objects in Mirror Are Closer Than They Appear, and it appeared on the jacket of the Crown hardcover in 1995. I still have a thing for that painting. There are many ways of reading this picture, and there are endless symbolic elements to decode, from the fruit on the sill to the candles in the light fixture. 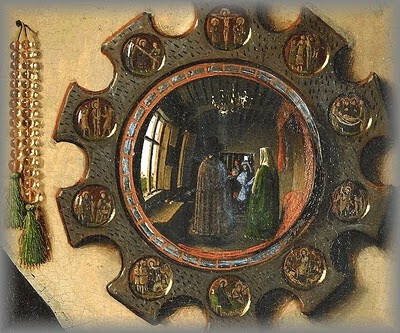 Among the various interpretations, the painting is thought to be a document, a record of the marriage depicted, with the painter, Van Eyck, appearing in the reflection as a witness. My 34th wedding anniversary was on Sunday, and perhaps because of that, and also because I just saw the new cover image for the forthcoming Broadway Books paperback re-issue of Objects (Summer 2011), which is a fantastic design with a photograph and not this painting, I found myself wanting to look at the reflection detail particularly. Here it is. The Harkin-Engel Protocol was signed in September of 2001, at a moment when the world was preoccupied with other things. 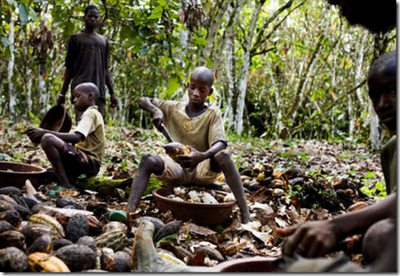 It was meant to be the beginning of the end of child slavery in the cacao fields of Western Africa. But it was really just a document and nothing more than a wish list. The reality is that today, right now, there are thousands of child workers. some of them virtual slaves, harvesting cacao pods on the vast plantations in Cote D'Ivoire and Ghana which supply much of the world's ordinary chocolate. These children have never tasted finished chocolate, but they work long hours harvesting cacao pods with few options or protections. These are young children who are not in school. It's not much of a childhood. This week, on Monday, it was announced that the United States government and the chocolate industry pledged a total of $17 million "to help end child labor, some of it forced and dangerous" in those two African countries. "If there's one thing people around the world share in common it's our love of chocolate. But it is a bitter reality that the main ingredient in chocolate, cocoa, is produced largely by child labor," said Sen. Tom Harkin, D-Iowa, at a signing ceremony for a new agreement between industry, the Department of Labor, the Ivory Coast and Ghana. Let's see it. Wouldn't it be great if just one big confectionary company could certify that their product was made without child labor? Right now, not one of them can make that declaration.